This entry was posted on October 4, 2016 by Jessica Anderson. One of my favorite times of year, the Pacific Northwest is beautiful in fall. Autumn includes warm September days, crisp clear nights, fall colors in the trees, the return of the salmon, Octoberfest and best of all, FOOTBALL! Even though football is in full swing, now's time to look forward to the end of the season, celebrating accomplishments of players and thanking those who support your team. There's three categories of important people to acknowledge - Players, Coaches and Parents, and Sponsors. Our top selling football awards for your team, top players, and outstanding coaches! For young pee-wee players, they may receive a participation trophy from their league for playing this season. This is especially common for kiddos in their first few years of football. Great choices for football participation awards include Star Spinner Football Trophies, Pee Wee Football Trophies, and the Boys Football Column Trophy. Football medals and Football dog tags are also popular choices for your youngest players. As the kids get older, they may get trophies less for participation and more for winning. Popular choices are football tournament trophies , large football trophies, and resin awards, such as our Lombardi Replica Junior Football Championship Trophy. For even more ideas, read the Guide to Kids Trophies by Age. Then there are special awards, such as Offensive MVP and Defensive MVP. Many times these players receive plaques such as a Full Color School Plaque. Be sure to make it meaningful with special words of praise, individualized to each player. For graduating seniors, probably the coolest trophy I have ever seen was a custom designed plaque made by Issaquah High booster parents. They split a helmet in half (I have no idea how they do it!) and then mount it onto a large board. We then supply the engraving that is attached to the board next to the helmet. It is a gorgeous award that becomes a treasured keepsake for those players and their families. Get even more great coach gift ideas on our Pinterest Page! Coaches get many gifts over the years, so if you do give a coach award, make it personal. I recommend a signed ball with a holder, a picture plaque, an engraved whistle or clipboard. Another small funny gift is a coach bobble head. Then pool parent's money together to purchase a gift card to the coach's favorite store or restaurant. For more ideas visit Top Gifts for Coaches or our Coach Gifts & Awards Pinterest Page. 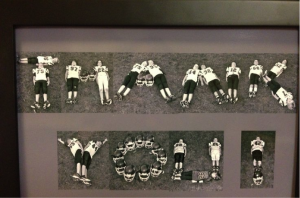 Team parents, such as booster club members, PTA supporters, concession seller, and other adult volunteers also deserve recognition for their contributions to the football season. A small gift, such as a coffee gift cards, with a hand written note, is a nice gesture for those parents who go the extra mile to support your team. Whether you like it or not, community sponsors are often necessary to support the team. Being a community business that often gets hit up for money, I understand how sponsors want recognition and exposure for supporting your team. Here are some ways to acknowledge your football team's sponsors. 1. Publish them and what they do in the program. I can't tell you how many times I've seen a sponsor name, but I have no idea what they do or sell. Make sure to tell your fans. 2. Announce the sponsor on the loud speaker. Maybe you feature a sponsor a game. Just make sure your fans see and hear the name. 3. Memento of their contribution. Favorite items include plaques that sponsors can hang on their wall. One extremely popular option for sponsors are picture plaques with a photo of the team and then the sponsor's name and year. Another choice is the Full Color School Plaque, completely personalized to your school colors and mascot. Our engraver Lori individually designs each plaque to match your school! 4. Thank you. A hand written note from the players makes an impact. Your football season is a memorable time for all involved, including the coaches, team parent volunteers, sponsors and most of all, players. 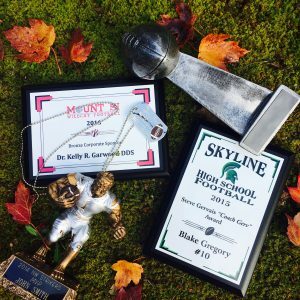 Make it count with awesome football awards everyone will cherish for years to come.